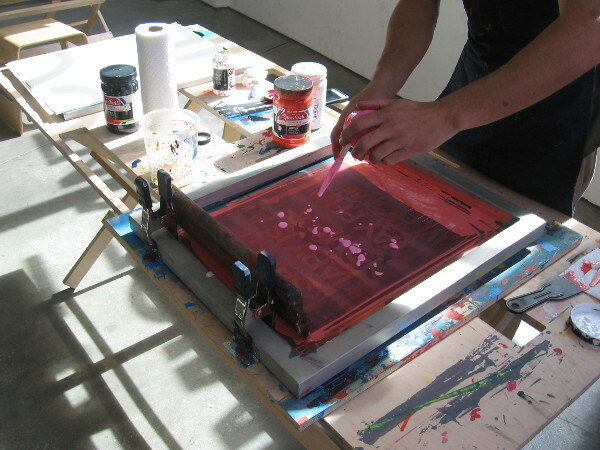 printing – Cool San Diego Sights! 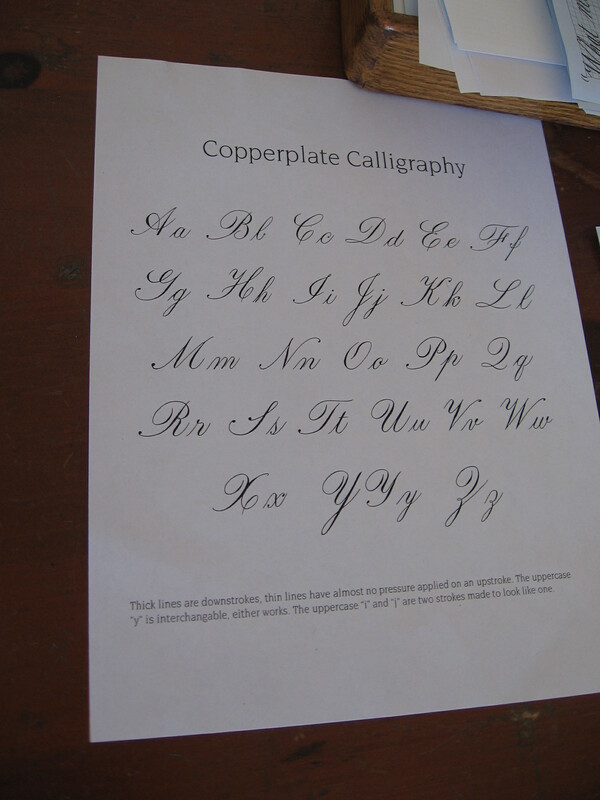 Learning one’s letters in Old Town San Diego. In the one room Mason Street School in Old Town San Diego, younger and older children sat together before the teacher and learned their letters. A cool theme developed during my walk through Old Town San Diego State Historic Park yesterday. 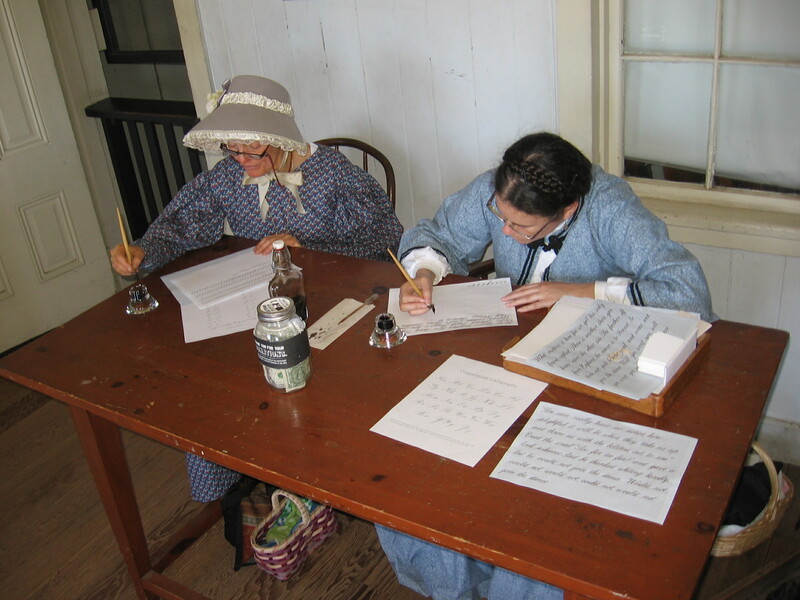 First I wandered into the 1868 San Diego Union Building and observed ladies in 19th century dress practicing calligraphy. A short time later, as my eyes scanned the walls of the one room 1865 Mason Street Schoolhouse, I noticed a sheet on the wall titled First Lessons in Penmanship. Turns out it was a great day to relearn the alphabet! 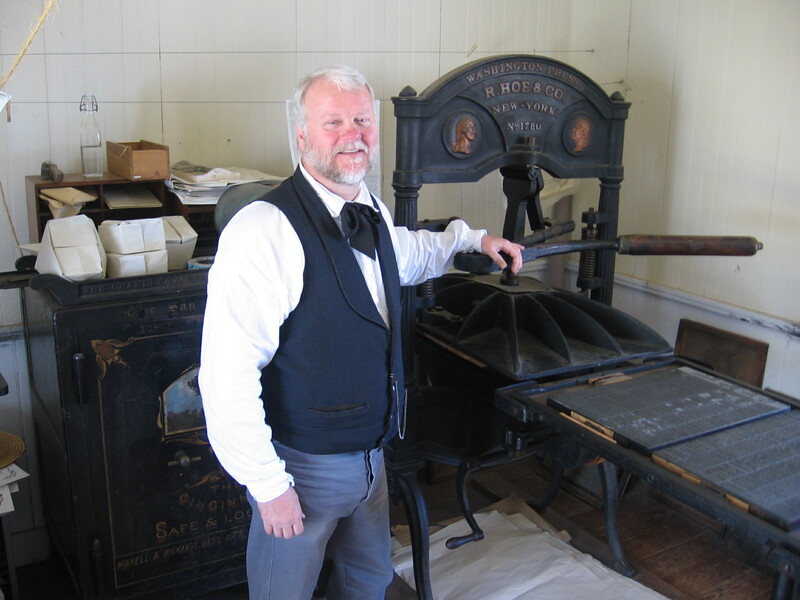 A super nice gentleman in the old print shop provided all sorts of tidbits of information concerning printing, publishing and life in early San Diego. 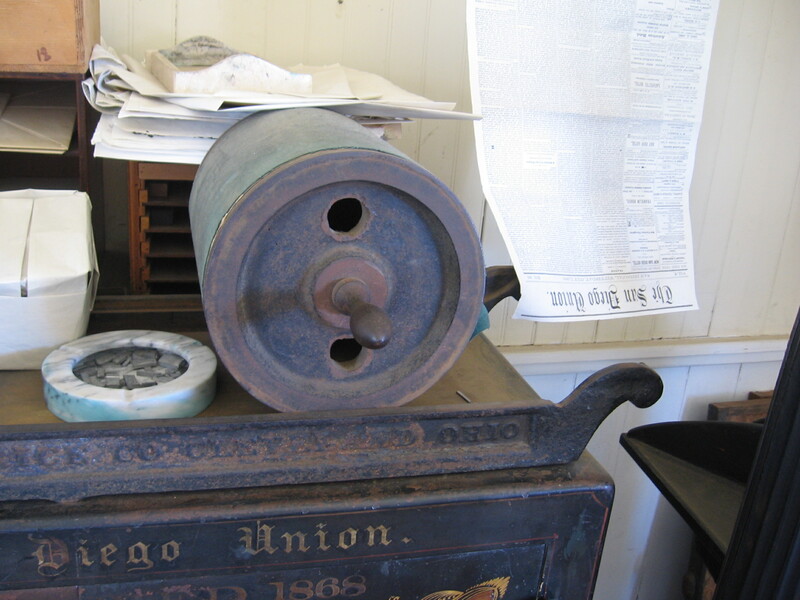 I learned the original Washington hand press that was used by the San Diego Union newspaper is now in the collection of the Henry Ford Museum of American Innovation. And that setting up the tiny type for a single page of the newspaper took a keen-eyed person about 12 hours! I posted photos of the old print shop and editor’s office four years ago. 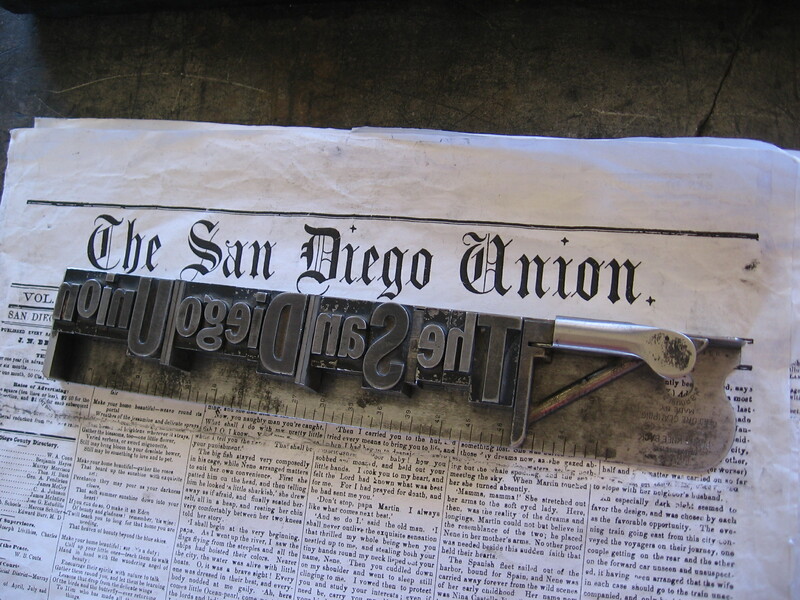 I also wrote a little about the San Diego Union’s history. You can revisit that blog post by clicking here. You can see much more inside the old Mason Street School building and learn more about San Diego’s first school teacher, Mary Chase Walker, by clicking here! Additional information that I learned yesterday is in my photo captions! 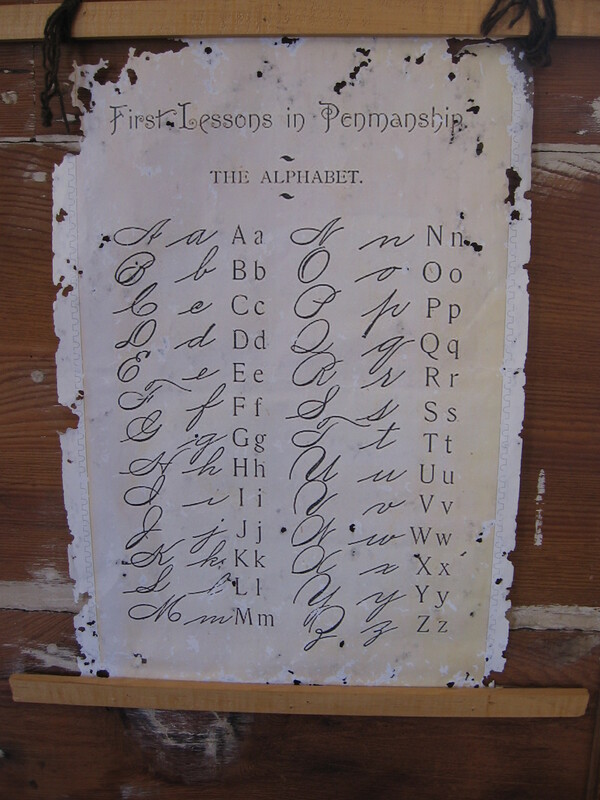 A sheet on the schoolhouse wall contains First Lessons in Penmanship. THE ALPHABET. I’m given a small tour of the print shop inside the historic San Diego Union Building. Like wet laundry, hundreds of newspaper sheets would be strung up all around the print shop so that the freshly impressed ink would dry! 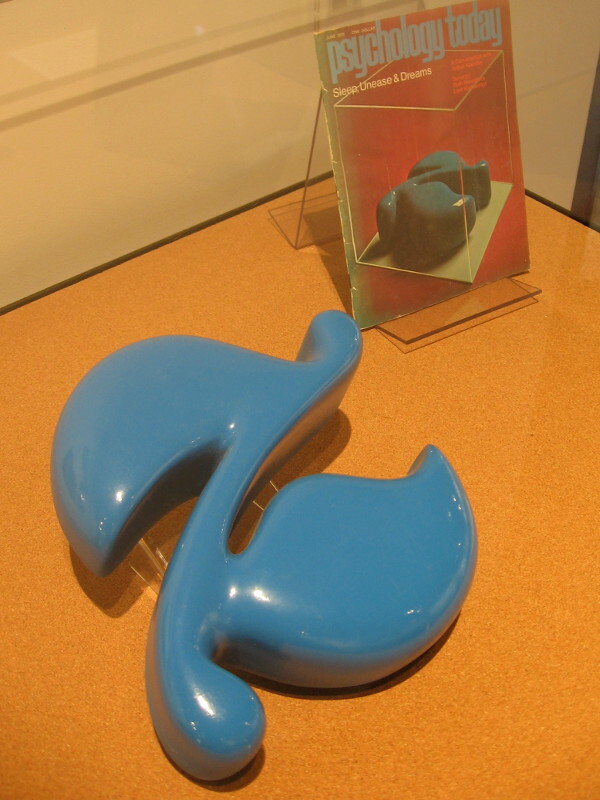 A demonstration of assembled type and a finished impression. Part of a large plate in the massive Washington hand press. 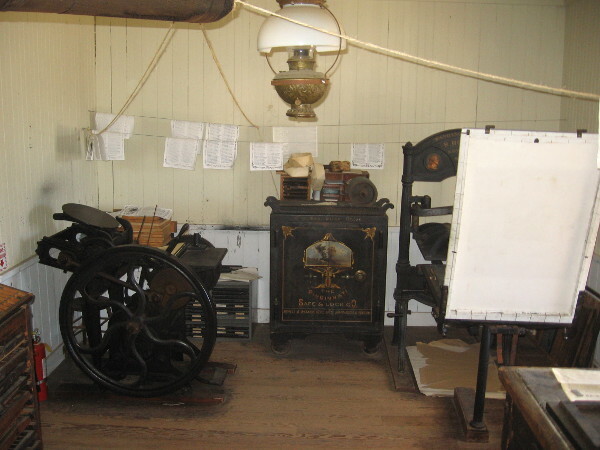 Today school students often visit the historic print shop to learn about publishing long before the digital age. Those students can rearrange these letters to spell words like SUPER. To proof newspaper sheets as type was assembled, this huge heavy roll would be used to make a quick impression. In the entrance of the San Diego Union Building, ladies sat at a desk practicing their penmanship. 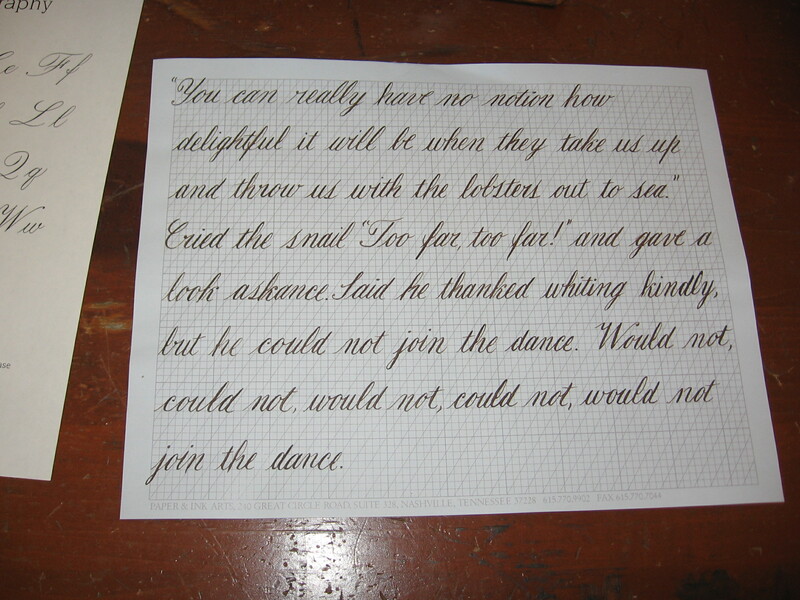 A sample of elegant Copperplate Calligraphy. This beautifully penned text is from Lewis Carroll’s humorous Lobster Quadrille in Alice’s Adventures in Wonderland. 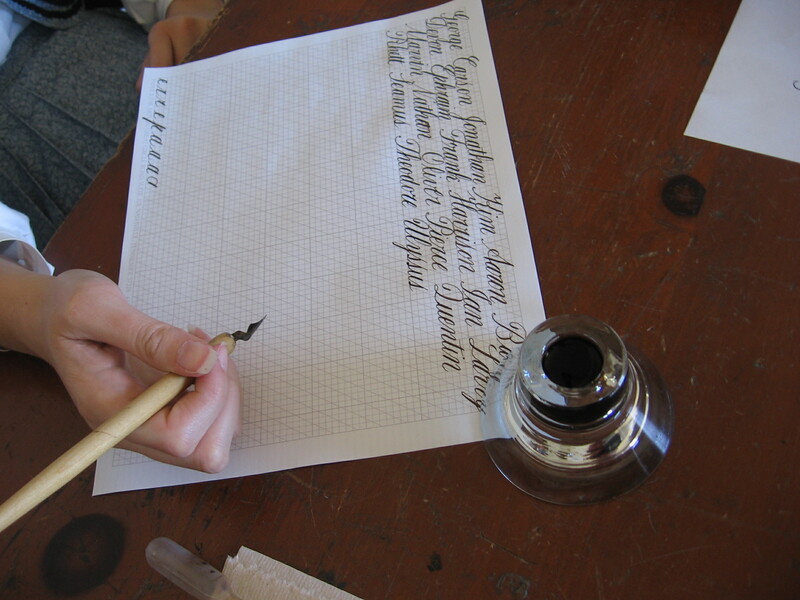 Showing how to write fancy letters with an old-fashioned pen and inkwell. You can find small, thought-provoking works of fiction at my website Short Stories by Richard. Posted on March 31, 2019 April 1, 2019 Tags buildings, education, history, ink, newspapers, old town, photography, printing, publishing, san diego, schools, tour, words, writing6 Comments on Learning one’s letters in Old Town San Diego. 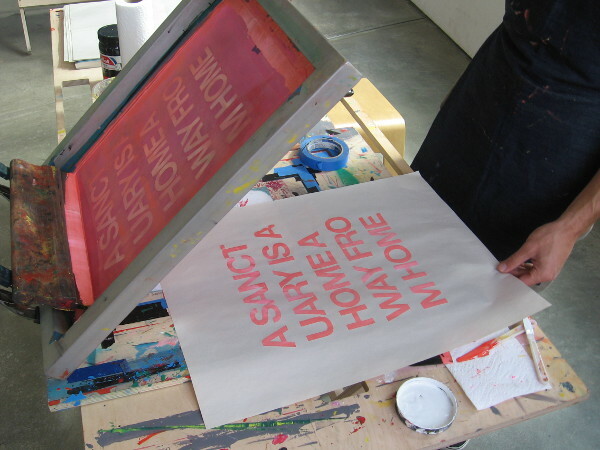 Printing words about immigration at MCASD. As I waited for a trolley at America Plaza early this afternoon, I thought I’d peer into a window of the Museum of Contemporary Arts San Diego. A gentleman inside saw and motioned for me to come on in! 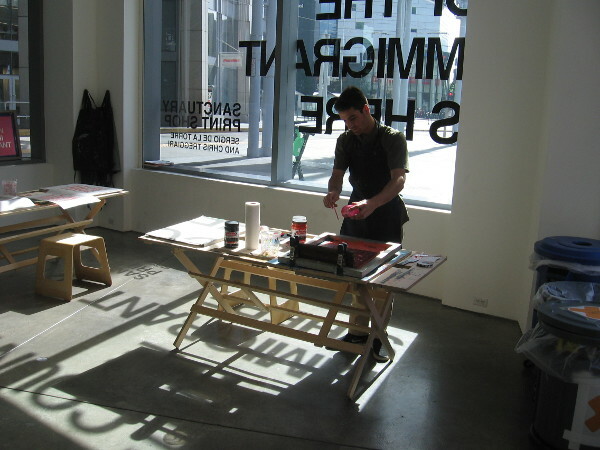 I was welcomed by Max, a super nice Gallery Educator, who was applying ink to a silk screen. 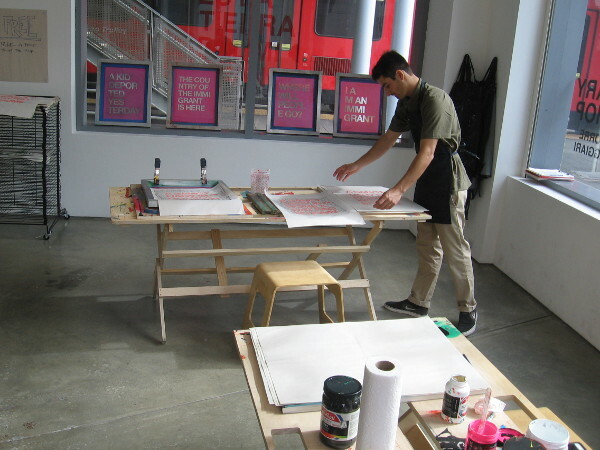 He was using screen printing to create bold messages in the Sanctuary Print Shop! 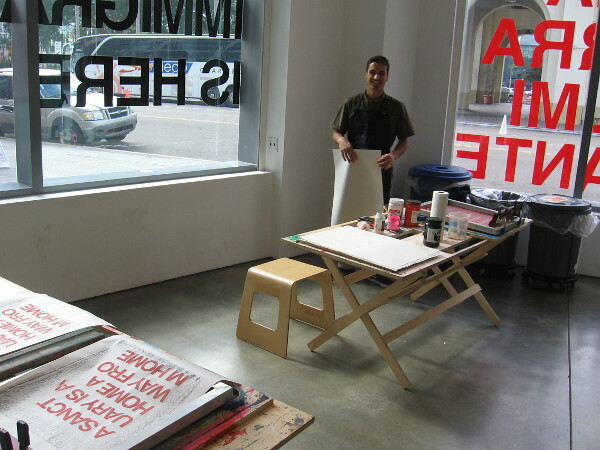 The project titled Sanctuary Print Shop is the brainchild of artists Sergio De La Torre and Chris Treggiari. The idea of this exhibition is to start conversations concerning the very topical and divisive issue of immigration. 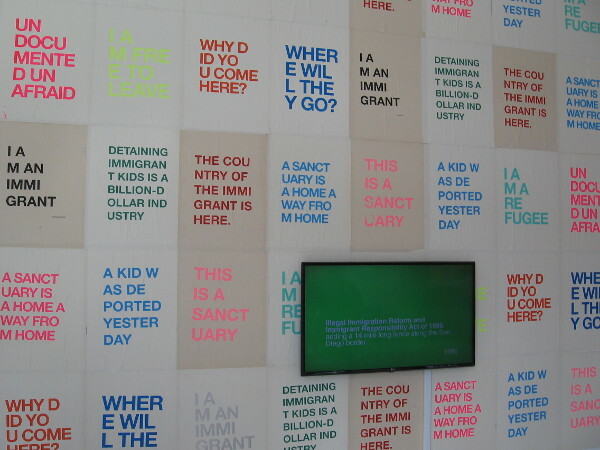 People are encouraged to write their thoughts about immigration, and messages are created to paper one wall. Even though there’s a certain political bias to the exhibition, Max did agree that it’s a complex human issue. There are many different thoughts concerning it. And it’s an issue with many personal connections. Human creativity and the written word fascinate me, so I enjoyed meeting Max, watching him at work, and reading what others have said! 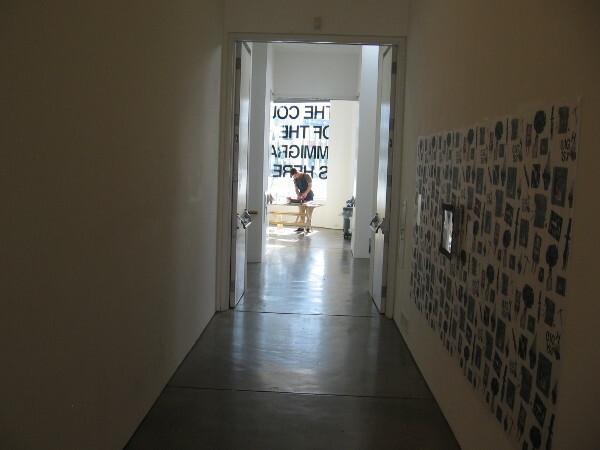 Posted on February 9, 2019 Tags art, artists, controversial, creativity, downtown, ideas, immigrants, museums, people, politics, printing, san diego, words, writingLeave a comment on Printing words about immigration at MCASD. 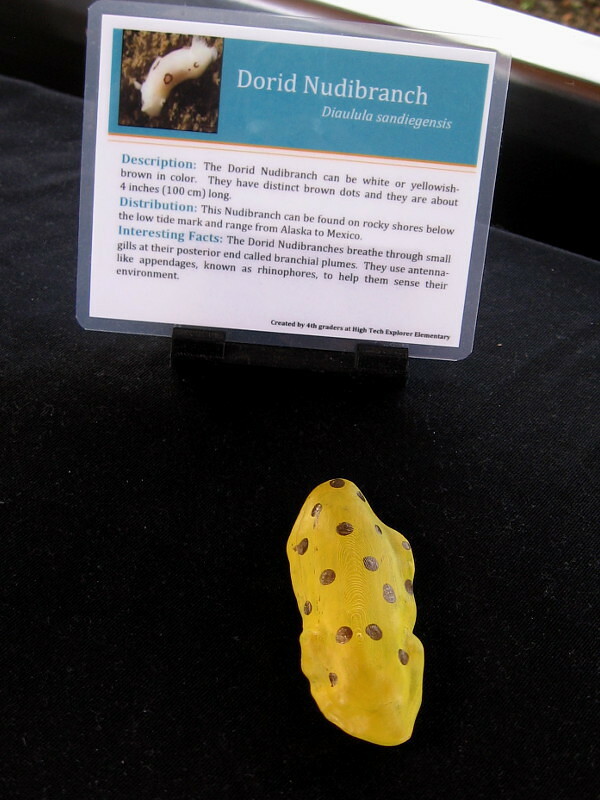 How to create 3D printed intertidal organisms! Sign inside Visitor Center at Cabrillo National Monument describes the fascinating 3D Cabrillo project. 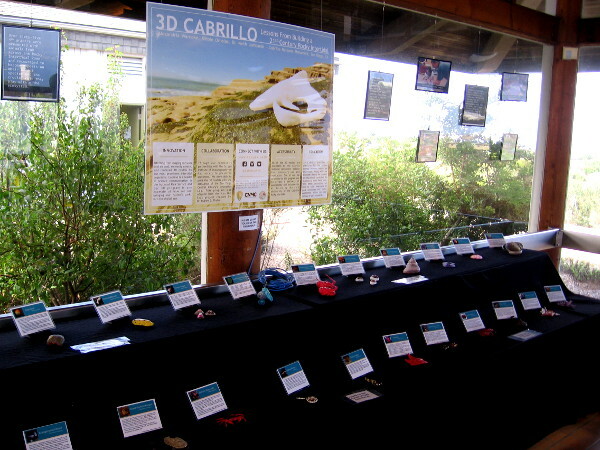 The Visitor Center at Cabrillo National Monument has a cool exhibit of 3D printed intertidal organisms. 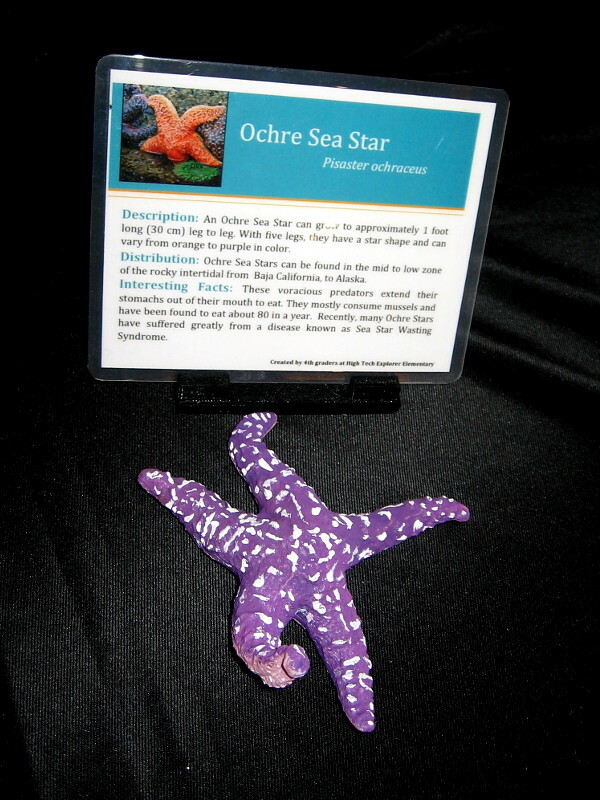 An explanation is provided of how the tide pool animal models were created, and shows how the general public and interested educators can easily access essential resources via a dedicated website! Student curriculum, simple instructions and the 3D Cabrillo biomodel .STL files library (and a link to raw Autodesk files) are all found here. 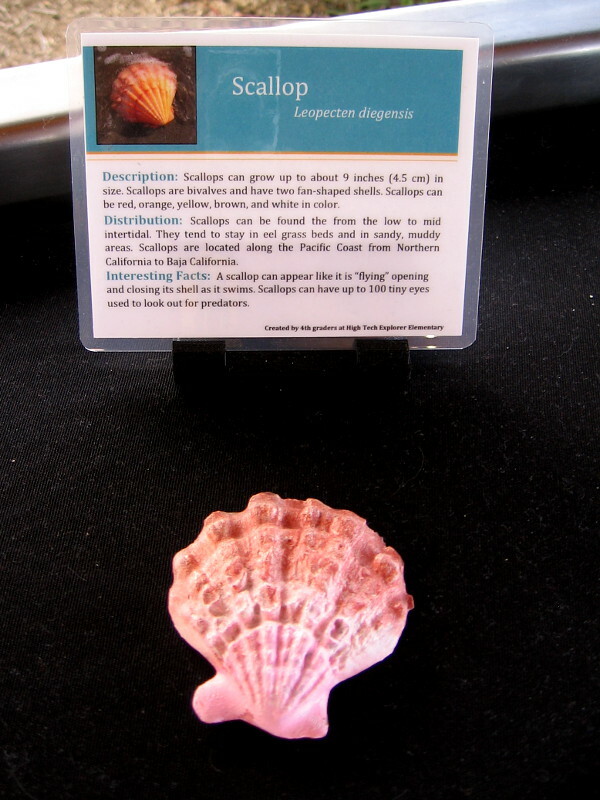 For 3D Cabrillo and the particular models seen in this exhibit, free imaging software and an iPad were used to capture images of intertidal organisms preserved by La Jolla’s world-renowned Scripps Institute of Oceanography. 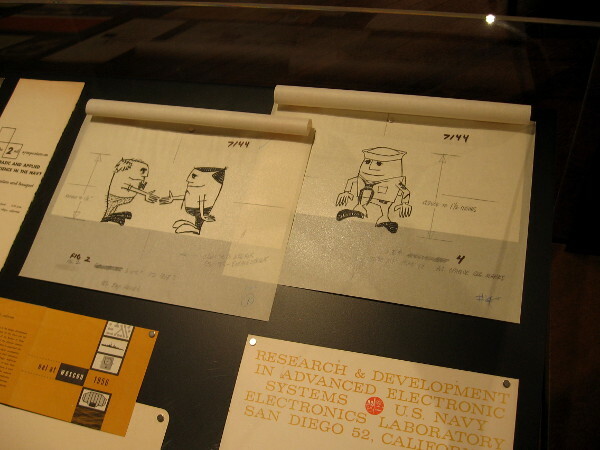 After models were edited on a computer using design software, they were sent to a 3D printer at the San Diego Central Library’s Innovation Lab. This program was adapted from the Scan Our Seas project created by Dr. Andrew D. Thaler. Do you know of any school students who’d like to learn more about marine biology, the environment and technology? This is definitely a very cool (and fun) project! 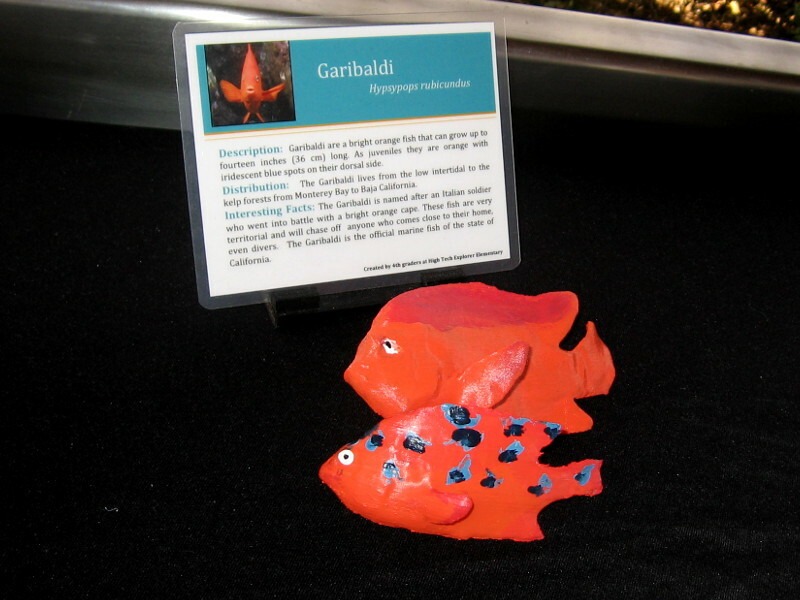 Many colorfully painted 3D printed models of intertidal organisms are on display inside the Visitor Center. 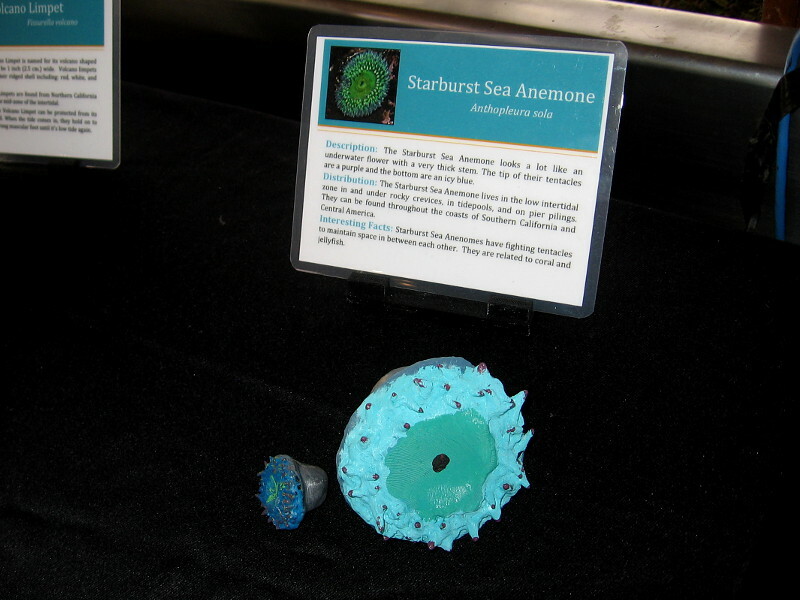 3D printed Starburst Sea Anemone. 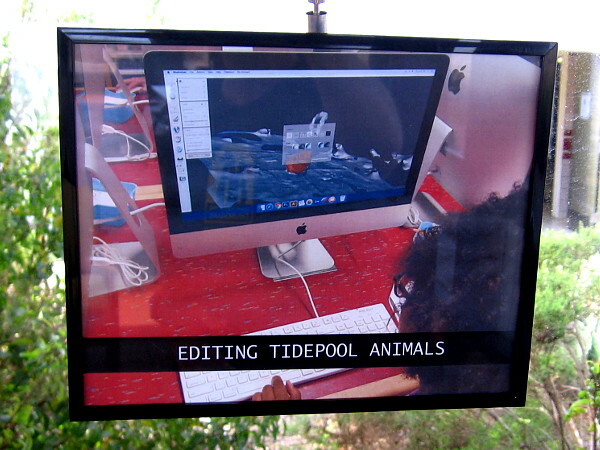 A video shows the 3D printing process, including editing the tidepool animals. 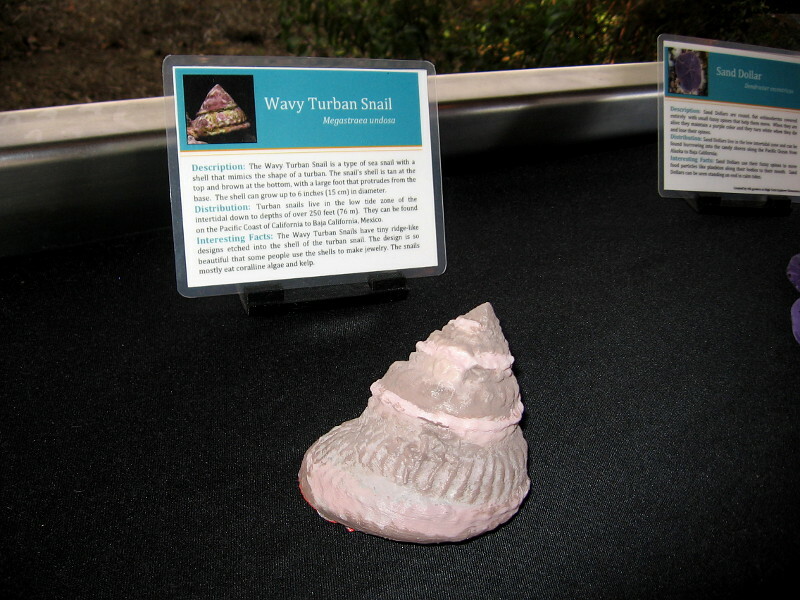 3D printed Wavy Turban Snail. 3D printed Ochre Sea Star. 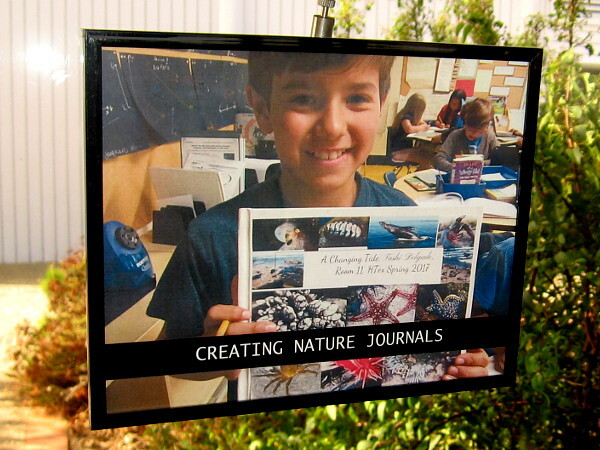 Students are encouraged to create nature journals. Writing is fun, too! You can easily explore Cool San Diego Sights by using the search box on my blog’s sidebar. Or click a tag! There are thousands upon thousands of interesting photos for you to share and enjoy! 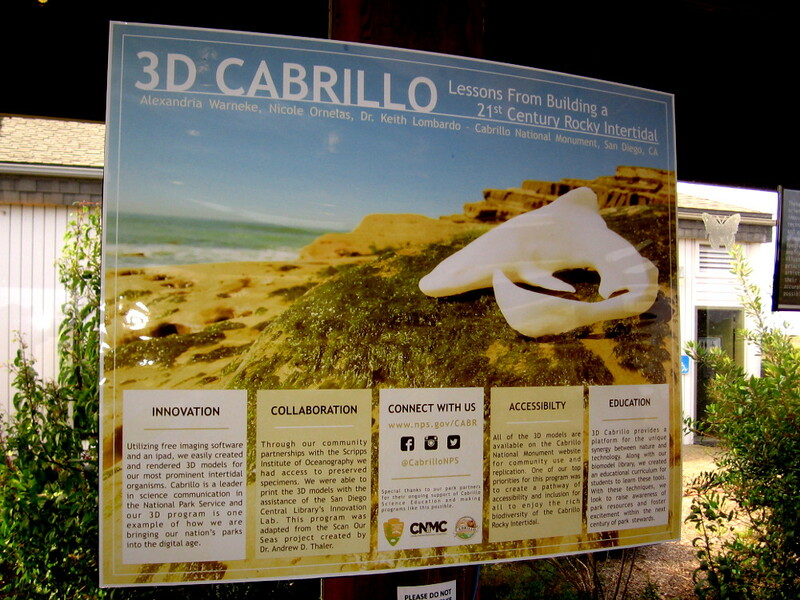 Posted on October 1, 2017 Tags animals, cabrillo national monument, cool, creativity, education, environment, fun, internet, libraries, marine biology, printing, science, students, technologyLeave a comment on How to create 3D printed intertidal organisms! 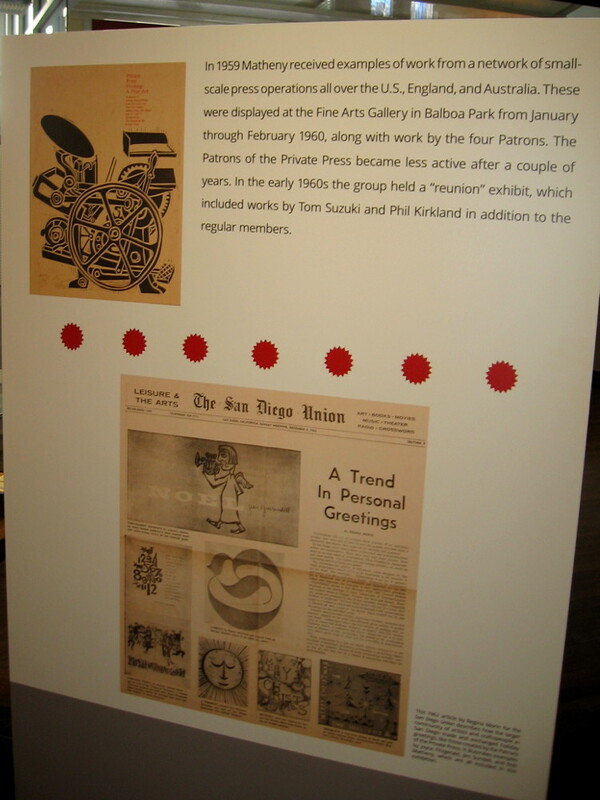 Print Culture exhibit at San Diego Central Library. 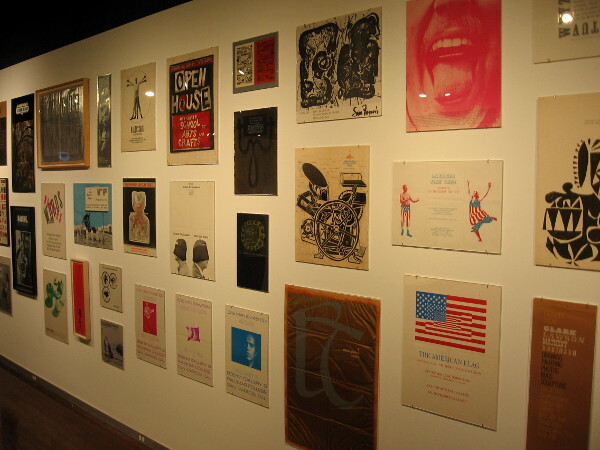 A special exhibit at the public library in downtown San Diego showcases modern graphic design from the mid-twentieth century. A fascinating exhibition at the San Diego Central Library will be running through May 7, 2017. You can find it on the 9th floor in the library’s Art Gallery. 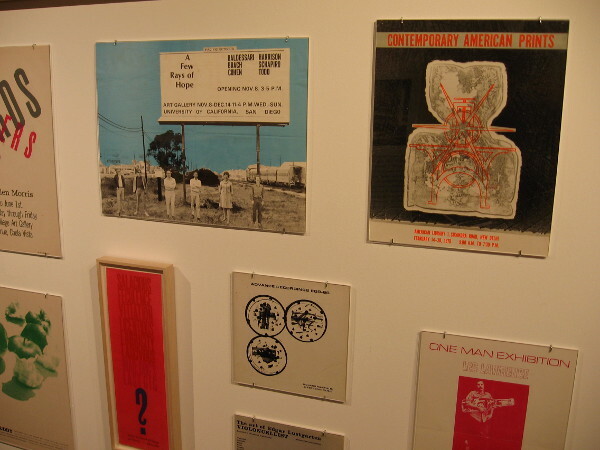 The exhibition, titled Print Culture: Midcentury Modern Graphic Design in San Diego, concerns artistic expression and the evolution of printing technology during the mid-20th century. Emphasis is placed on San Diego-based independent artists and local businesses, particularly defense contractors. 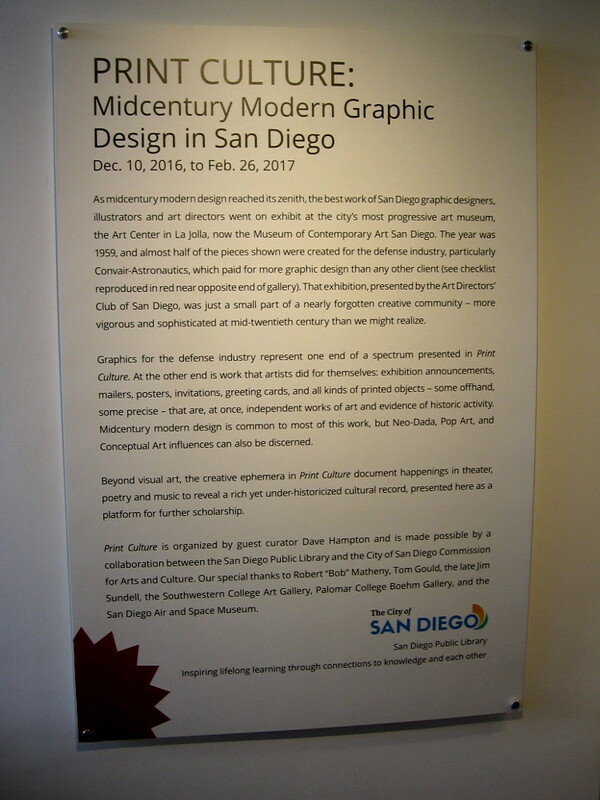 Artists, graphic designers, printers and those who enjoy learning about San Diego’s history and culture really should pay a visit to the gallery. Here are some photos which provide a taste of what you’ll see. Print Culture: Midcentury Modern Graphic Design in San Diego is an exhibition now showing through May 7, 2017. The work of local designers, illustrators and artists is on display. Many images created locally for various purposes are shown in the gallery. A uniquely bold style of graphic design emerged in the 1950’s and evolved over the ensuing decades. I was interested to see an image of Donal Hord’s sculpture Aztec. A few days ago I posted several photographs that I took of this iconic work of art. 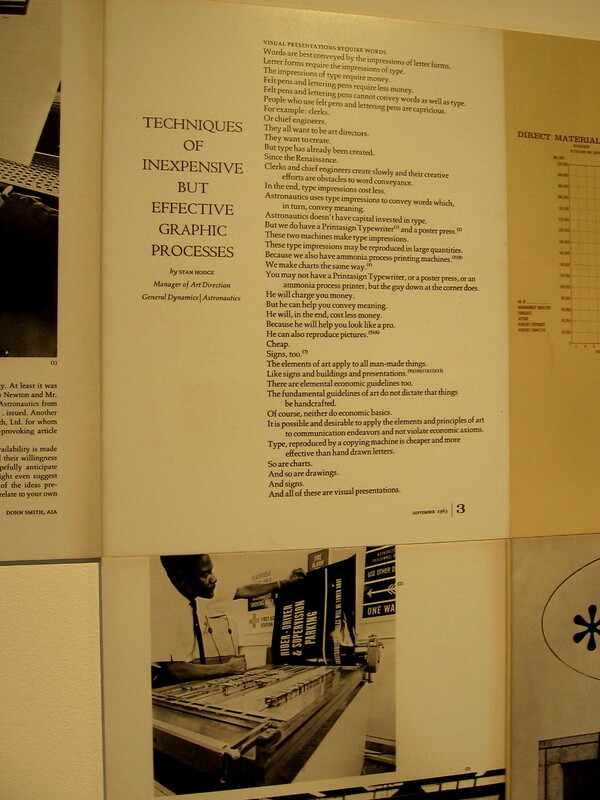 More examples of graphic design from this sometimes overlooked period. 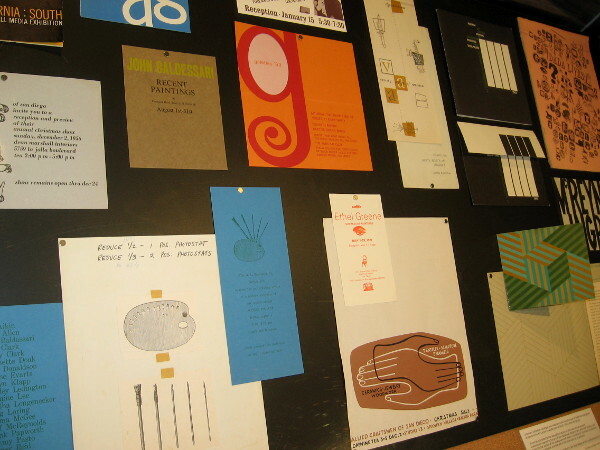 Many creative artists produced their own printed material. 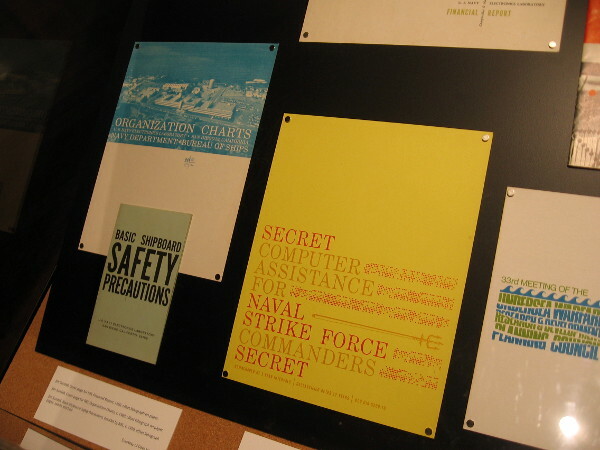 The defense industry in San Diego produced many posters, drawings, charts, presentations and signs in the mid-20th century. Printing machines evolved which facilitated their production. 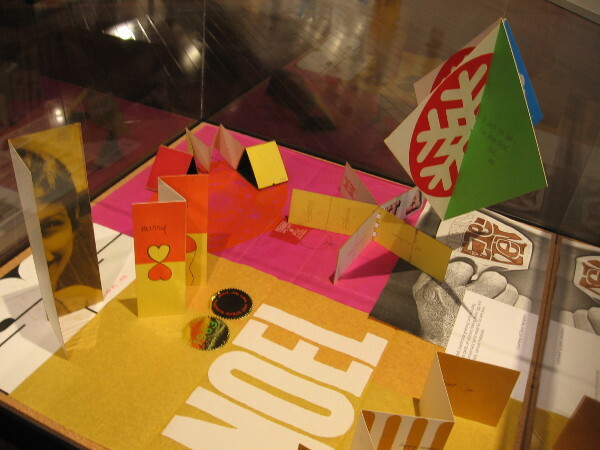 More interesting examples of printed artwork and ephemera. 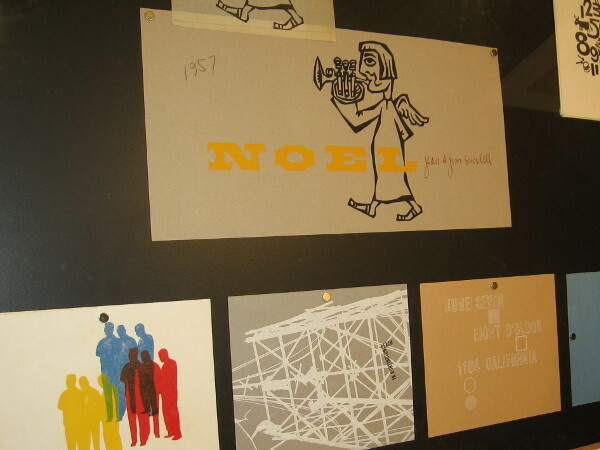 Small-scale press operations created many types of colorful printed material, including greeting cards. 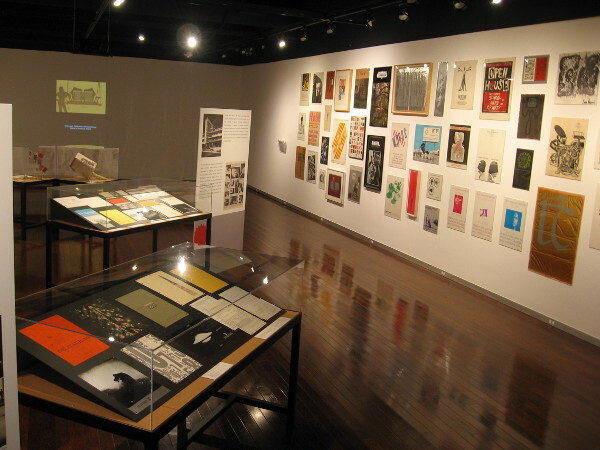 A display case in the Central Library’s gallery contains more unique examples of printed art from the mid-twentieth century. This special exhibition contains many pieces that one can study and admire. Colorful posters, invitations and cards were popular in the mid-1900’s. Graphics designed specifically for fine art galleries are also on display. Some graphics produced by San Diego-based companies for the military. The U.S. Navy’s large presence in San Diego required the production of many pamphlets, charts and other printed documents. 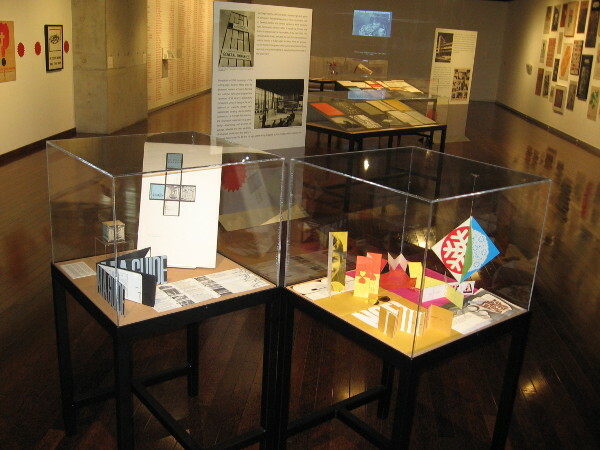 One display explains how physical art was first conceptualized and created before finally being printed on a magazine cover. 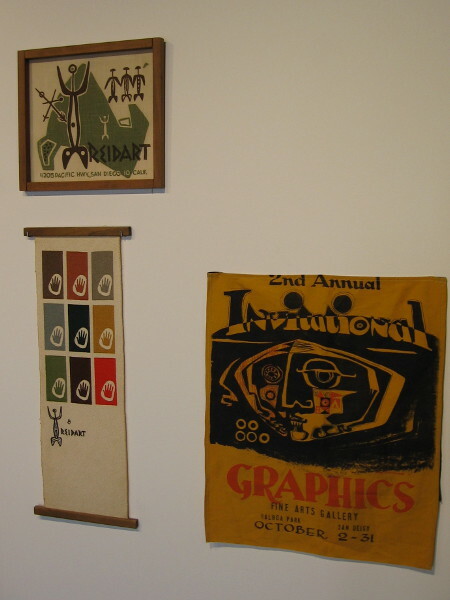 A fascinating look at another era’s artistic expression through graphic design. It’s apparent that our culture has been greatly influenced by the evolution of printing technology. Writing is a struggle. After revising my latest short story over and over again, I believe that I finally have it right. This story is so short you’ll be able to read it in less than one minute! It’s called The Piano Player Sat Down. Posted on March 4, 2017 March 4, 2017 Tags art, artists, business, creativity, culture, history, modern art, museums, printing, publishing, san diego, san diego library, technology, writingLeave a comment on Print Culture exhibit at San Diego Central Library. History inside Old Town’s San Diego Union Building. 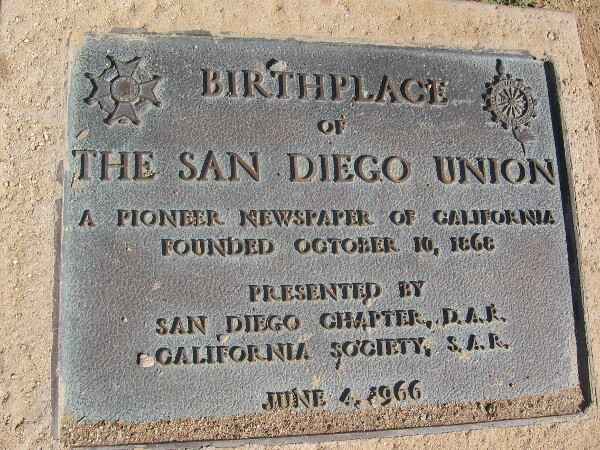 Plaque marks the birthplace of the San Diego Union newspaper in 1868. There are many interesting houses and buildings within Old Town San Diego State Historic Park. One of the most fascinating is the San Diego Union Building. Take a step inside and you’ll see the carefully restored birthplace of a present-day major newspaper: the San Diego Union Tribune. The framework of the building, erected around 1851, is believed to have been originally fabricated in Maine, then shipped to San Diego around Cape Horn. 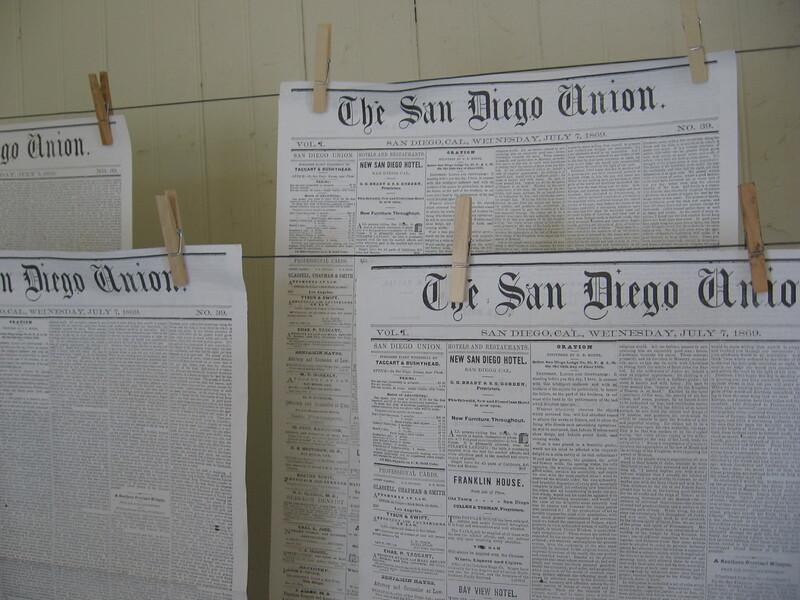 The San Diego Union was first published on October 10, 1868. The newspaper’s editor at that time was Edward “Ned” Wilkerson Bushyhead, a Cherokee Indian with a Scottish ancestor. 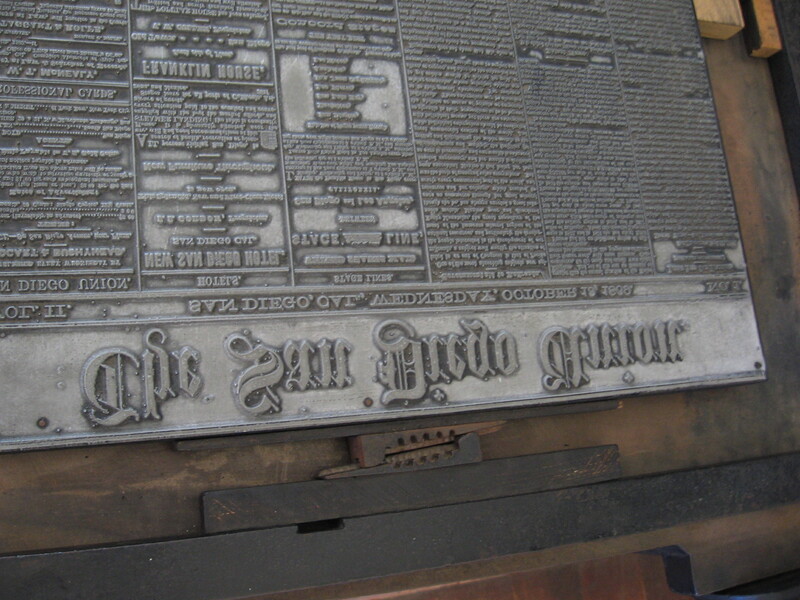 The newspaper began as a modest four page weekly, and was produced on a massive wrought iron Washington hand press. 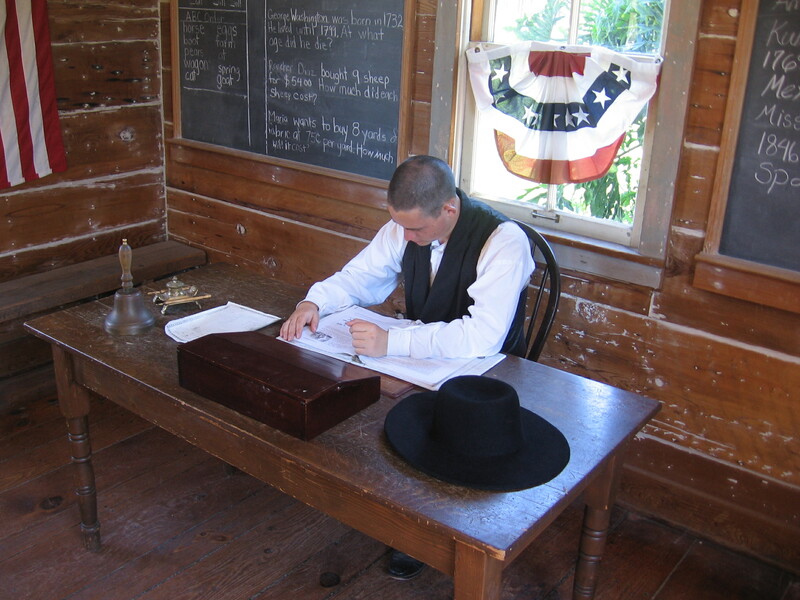 In the museum one can also see an authentic 1860’s recreation of the editor’s room, which contains a desk once owned by the son of Ulysses S. Grant! 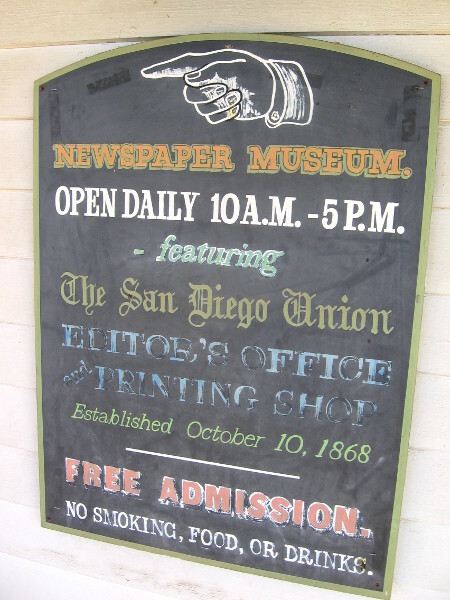 The San Diego Union Building in Old Town San Diego State Historic Park contains a print shop and editor’s office. The prefabricated wood-frame building was erected circa 1851. In 1967 the building was restored by James S. Copley, who at the time was owner of the San Diego Union Tribune. 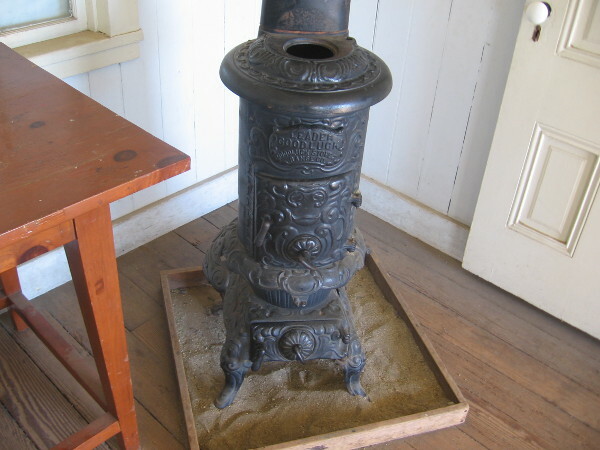 Old wood stove just inside the front entrance of accurately restored newspaper office. Drawers hold hand-set type that used to be assembled in a press for newspaper printing. 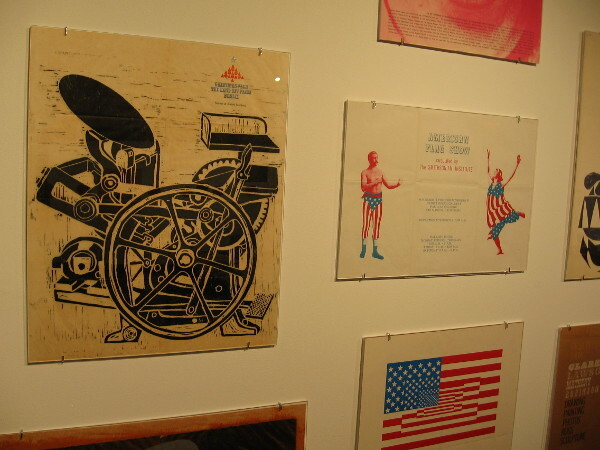 A massive Washington hand press can be glimpsed to the right in the small printing shop. The Newspaper Museum is open daily from 10 to 5. Washington hand presses were common on the frontier because of their relative light weight. They required two people for efficient operation. Fresh paper was laid on inked type and an impression made. Setting the type for new articles on just one page could take hours. Fortunately, many advertisements on a page didn’t change. 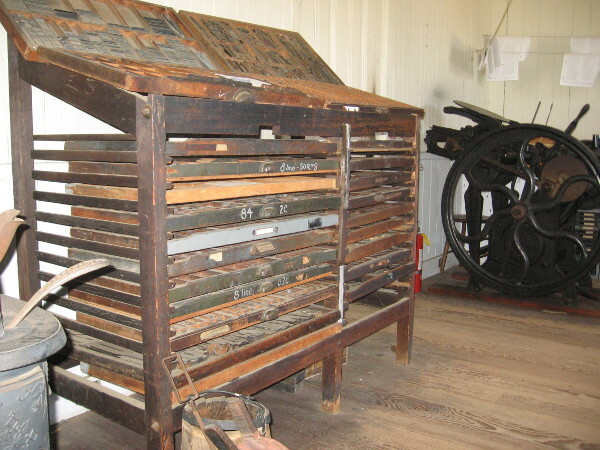 A jobber printing press like this would have been used for small jobs such as stationery and handbills. This safe is the only original object displayed inside the restored San Diego Union Building in Old Town. A type case full of large cast metal sorts. Individual letters were combined into words, sentences and paragraphs. 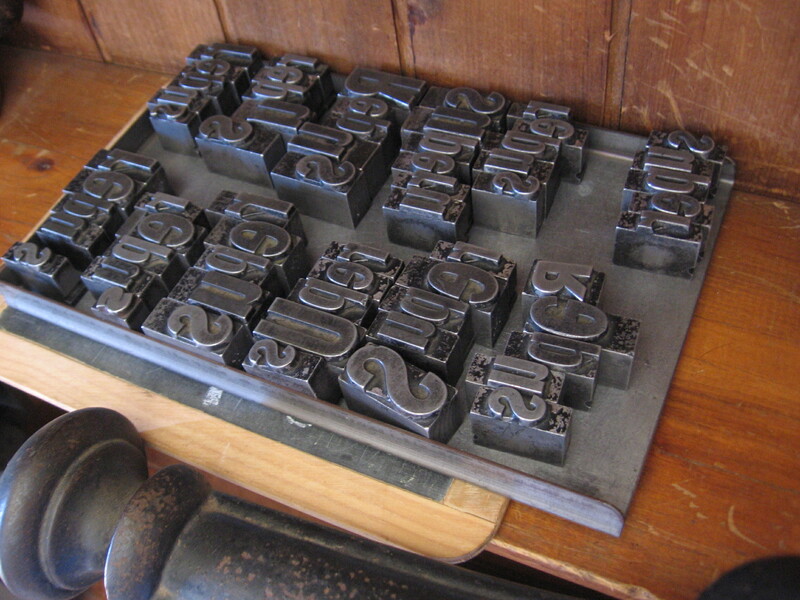 Manual typesetting for old presses, as one might imagine, took lots of patience and a good eye. Gazing from the print shop toward the small building’s entrance area. 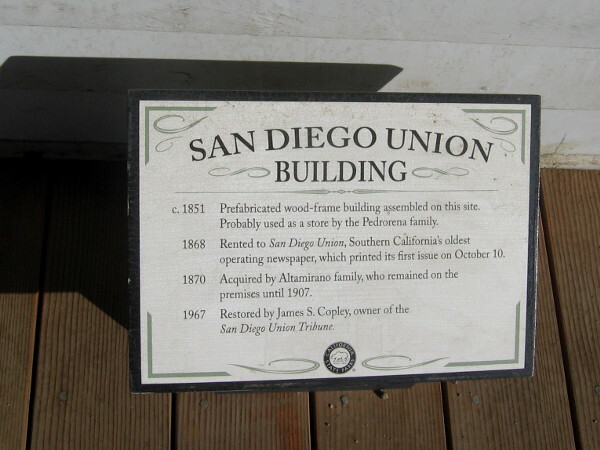 According to one sign, the San Diego Union Building was erected around 1850 by Miguel Pedrorena. The Washington Press, type and printing supplies arrived by steamship from Northern California. A knowledgeable lady in period attire explains how the San Diego Union newspaper was composed and printed a century and a half ago, long before the digital age. Posted on January 4, 2015 August 19, 2018 Tags buildings, historic places, history, museums, news, newspapers, old town, printing, san diego, tourism, travel, writing6 Comments on History inside Old Town’s San Diego Union Building.